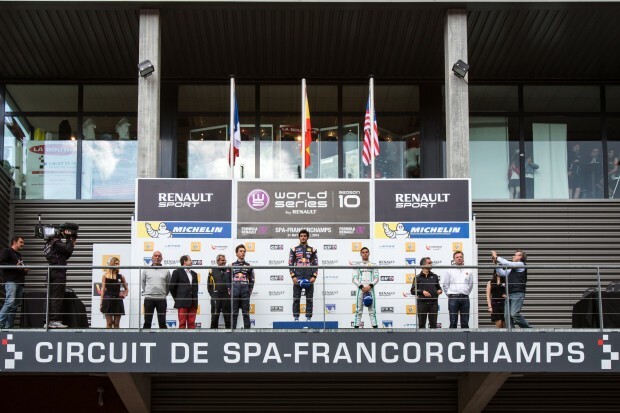 Jazeman Jaafar, Malaysia’s leading international single-seater racing driver, followed up his podium success in Monaco last week with another podium in Spa this weekend, racing through the field from a 14th place start to a trophy finish, in a very accomplished drive. Racing in the prestigious Formula Renault 3.5 Series, Jazeman had a strong weekend, finishing third in the first race and sixth in the second and the 21-year-old now lies sixth in the overall Drivers’ Championship. The opening day of the weekend, with two practice sessions for Jazeman, driving this season with ISR Racing, saw the team working on getting the car set up for the two races. The first session featured light rain, so the team focused on a set up conducive to these conditions. In the second session, the weather had improved and with a dry track, Jazeman and his engineer focused on developing the car’s performance for a rain-free day. Qualifying for the first of the two races on Saturday morning saw Jazeman fighting for a good grid position, however the young driver was not able to achieve his potential and struggling to put together the perfect lap on this notoriously difficult circuit. Finishing 14th fastest for a seventh row grid slot, gave Jazeman plenty of work for the race, but the Malaysian proved his prowess with a superb drive. At the start of the race Jazeman was quick off the line and had a good exit from Eau Rouge which put him in the right place to overtake two cars on the next straight. Jazeman narrowly avoided a tangle between a few cars ahead, which improved his track position and after a safety car period for this incident, Jazeman was back on the gas to take Marco Sorensen at the restart, followed by a great move on Monaco winner, Norman Nato, a few laps later. He then pushed on to hunt down third placed driver, Matias Laine, and after a string of quick laps, passed him on the penultimate lap to claim a well-deserved third place podium. Jazeman continued his weekend with qualifying for the second race and built on the momentum of his race performance with a strong fifth fastest lap and third row start. The PETRONAS supported driver didn’t have the best of starts and got just behind Sergey Sirotkin and Pietro Fantin into the first corner. Unfortunately for Jazeman, these two collided just ahead of him and he was forced to take avoiding action, backing off which resulted in him losing ground to the front pack. A quick pitstop kept Jazeman in sixth place and he crossed the line in this position for another strong points haul. Jazeman will return to racing action in the Formula Renault 3.5 Series at the end of the month, with the fifth round taking place in Moscow.